Sleep Better and Wake Up Refreshed | BioBrite, Inc.
A gradually increasing light, or a “dawn simulator,” can help you wake up in a gradual, gentle way. Scientific studies have shown that waking to a simulated dawn helps people feel more refreshed and wake in a better mood. The body is very sensitive to light in the early morning and therefore responds to fairly dim levels of light even through closed eyelids. Humans evolved to wake to the sun, so gradually increasing light sends the body the message that it is time to wake. This happens gently and naturally, a great improvement over the jarring sound that most alarms use. 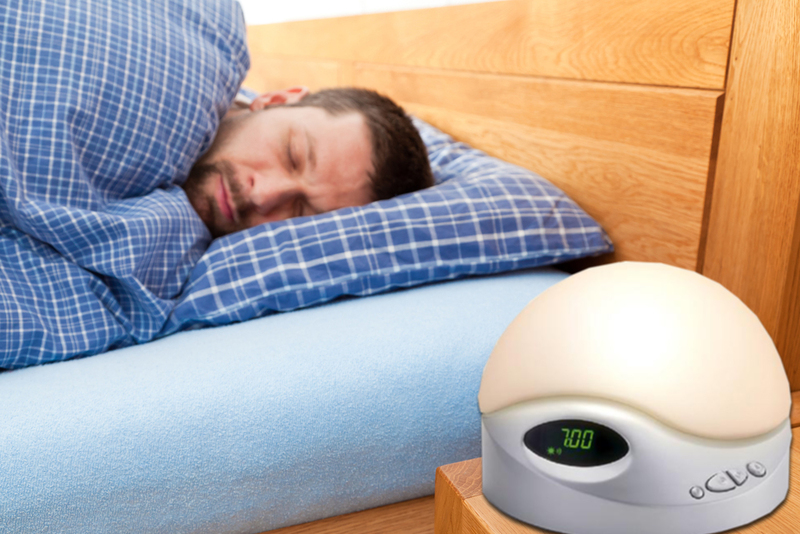 Using the SunRise Clock™ means that you wake up in a lighted room – a great benefit to early risers and shift workers, especially in the winter. SunRise Clocks™ offer a terrific boost to people with SAD, but they can help everyone wake up feeling more alert and ready to go. They have even been shown to help grouchy teenagers get to school on time, alert and ready to learn. It has long been known that daylight is a critical signal in keeping the “biological clock” (circadian rhythms) on time, consequently regulating the sleep wake cycle in humans and lower animals. Two relatively common sleep disorders, sleep phase delay, and sleep phase advance, have been recognized in humans. These disorders may respond to bright light therapy. Sleep phase delay (inability to initiate sleep, and to awaken at relatively normal times) is most frequently observed in adolescents and young adults, and may be treatable with two-to-three hours of bright light therapy applied in the morning for several days. Sleep phase advance (falling asleep, and wakening too early) is common in the 65-years plus age group, and can be treated with bright light applied in the evenings. These disorders can be complicated to treat, and we recommend that people with these problems consult a sleep-medicine specialist.